A lot of people believe making money with matched betting is only possible with the use and help of freebets. However, there are many ways to make money matched betting without freebets. In this article, we will explore some of the ways to make money matched betting without freebets. If you are only relying on the use of freebets to make money from matched betting each month, you are leaving so much more money on the table. Freebets are great to begin with and also great to take advantage of the reload offers with freebets attached to them, but knowing how to make money from matched betting without freebets is what will ultimately further propel your matched betting profits. 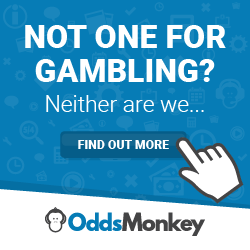 Using Oddsmonkey is crucial to knowing how to make money from matched betting without freebets as they have all the software to help make your life easier. Time is money at the end of the day and Oddsmonkey has built software to make the process of finding excellent matches less time consuming as possible. Doing this manually will take hours and hours of your time and isn’t necessarily going to mean you will find the most profitable matches either. Using the Oddsmonkey software is quick, convenient and efficient. Each way arbitrage is one of the great pieces of matched betting software Oddsmonkey has to offer on their premium membership. Each way betting is placing two bets; one bet on the selection to win the event outright and another bet on the selection to finish in the top places determined by the bookmaker. The back and lay odds on the selection to win outright won’t create an arbitrage opportunity but the difference between the back and lay odds for the place will be different enough to create an arbitrage opportunity and that is where this software is very useful. It will scan the bookmaker betting markets and compare them against the exchanges to find you the most profitable bets to place as soon as you click the refresh button. This doesn’t require freebets from the bookmaker and just uses the power of mathematics as with many of the other methods mentioned in this article. Dutching is again another great way to make money matched betting without freebets. Dutching takes advantage of the discrepancies between bookmakers and the Dutch matcher on Oddsmonkey calculates your stakes so that you can ensure a guaranteed profit no matter what happens in the event you are betting on. Again this does not need free bets as this just uses different calculated stakes at each different bookmaker so that your profit is predetermined. My advice would be to never bet on a football game 1X2 market as betting on 3 different bookmakers on 3 different selections leaves a lot of risk to the odds potentially changing right at the last second. If the odds change when you have already placed bets on 2 of the 3 selections, you could find yourself at a loss so it is always best to place dutching bets on events or markets with just 2 selections. I always stick to Tennis matches or the over and under goals markets in football games as there are only 2 bets to place. Again no freebets are needed to be redeemed to make money from matched betting this way as it just relies on putting the odds into your favour. Many of the accumulators you see are acca insurance whereby you will be refunded a freebet to the same value of your initial stake. This will usually only happen if one team fails to win in your accumulator. If this does happen then you will need a freebet refund from the bookmaker. But in my own experience, more often than not, 2 teams fail to win or they all win. It is very rare that I have needed a freebet from the bookmaker on the back of my accumulator losing due to just one selection. Freebets are needed for accumulators but ONLY WHEN ONE SELECTION FAILS TO WIN. Otherwise, you will never need a freebet for an accumulator bet so this is another great way to make money without needing freebets provided your accumulator wins or two teams fail to win. This is one of my favourite ways to make money matched betting without freebets. You simply place a bet on a football team and if they go 2 goals up, you will be paid out early at the bookmaker. Then you need to hope the other football team come back into it and equalise or end up taking the lead making the scoreline at least 2-3. Even if the opposing team score and make the score 2-1, you can use Oddsmonkey and their awesome early payout calculator to work out how much you need to back at the betting exchange. I have done this offer several times and made good money with it. It is all about picking the underdogs and hoping they take the lead by two goals. Recently in the game between Sevilla and Barcelona, I backed Sevilla and they went 2-0 up inside 50 minutes and then Barcelona scored 2 very late goals in the 88th and 89th minute to make me £223 profit! Again no freebets are needed here and it is a fun way to make money matched betting without freebets. I always would recommend ensuring you back an underdog (a team less likely to win) and make the qualifying loss approximately £2-3. Plus ensure your potential profit is £200-£300 minimum based on this as you would therefore need to lose 100 bets in a row to make money with this offer which again is extremely unlikely. There are many ways to make money matched betting without freebets. This article has looked at some of the ways you can actually continue to make money long after you have completed all the initial bookmaker signup offers and bonuses. Freebets are not necessary all the time to make money from matched betting and they may help in the beginning, they are not always vital for long term profits in matched betting. You will continue to get reload offers of freebets from the bookmakers but these methods mentioned in this article will also help you propel your matched betting for a long time to come. Hopefully after reading this article you are now aware there are many ways to make money matched betting without freebets and I recommend joining Oddsmonkey by clicking here in order to use their amazing matched betting tips.